Paid for an Search Engine Optimisation (SEO) audit and update, or even done it ourselves, making a silent promise to ourselves that we’ll keep on top of it. Alas, months and even years may pass without a thought for SEO improvements. It’s only when the traffic and conversions drop that we kick into gear. I recently made some on-page SEO changes to a website that hasn’t really been touched from an SEO perspective in over three years. The result of the changes I made was the daily visits surged from 20 to over 200—in just seven days. While these results are not completely normal, I thought I would share with you the on-page SEO strategies I used to get these results. Now, keep in mind: this website is over six years old, had a good foundation of backlinks and already had over 80 pages of already written content to work with. 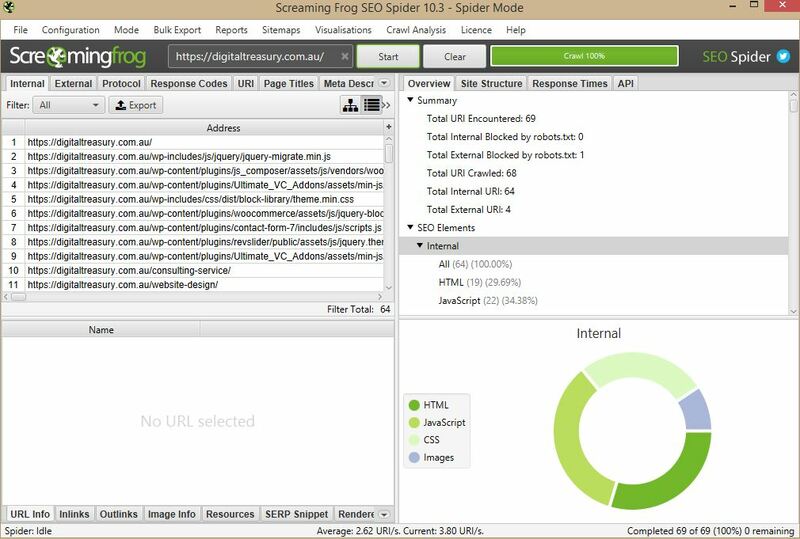 Screaming Frog is a free crawling tool that helps you quickly identify SEO errors on your website. Once you’ve downloaded and installed your copy of Screaming Frog, enter your website “URL” and click “Start”. This will begin to crawl your website and produce a tonne of data for you to review. When you have an older website, you’re bound to have some broken links. There’s a lot of debate around whether broken links effect your website’s ranking in Google. Google states that having a couple of broken links won’t effect your ranking, but the impact can be felt by visitors leaving your website. So for this reason, we think it is better to have no broken links on your website. Redirects are “URL forwards” that webmasters put in place when the old URL of a web page is changed. It is pretty normal for your website to collect a few redirects overtime. Excessive redirects can cause your website to start loading slowly due to loading the redirect and the eventual target URL page. Our review showed this website had: 97 internal links point to redirects. A common on-page SEO problem that websites experience is missing or duplicated page titles, meta descriptions, header tags or alt text. Our review showed this website was missing: 20 page titles, 37 meta descriptions, 12 H1, 3 H2 and 27 Alt Text. Note: our review also highlighted that there were not many images within our content. With all of the errors we found above, we went ahead and corrected all of them. Images can really help improve website ranking. But, images on your website must be interesting and informative to both website browsers and search engines. For this website, we found some pages didn’t include any photos and others only had one image. So we went ahead and used a mix of unique photos we took and stock photos we bought. We optimised the filename, alt text and title text to the target keyword of each page. The most popular page by website clicks is a mammoth 2,547-word guide to one of the products this business sells. 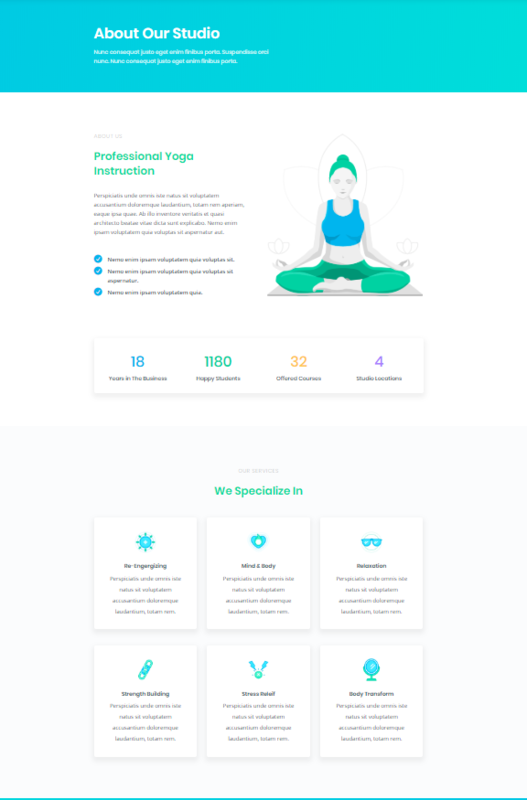 However, the design was your typical inner page design with the generic header and then the black text on a white background. Overall, the page is now more visually appealing and has seen a spike in time spent on the page. Whilst grammar and spelling are not exact ranking factors within Google, spelling mistakes and poor grammar can have a large impact on browser experience. As most of the content for this website had been tweaked and adjusted quite often over a 6 year period, some of the content had lost its ‘flow’ and ease of reading. 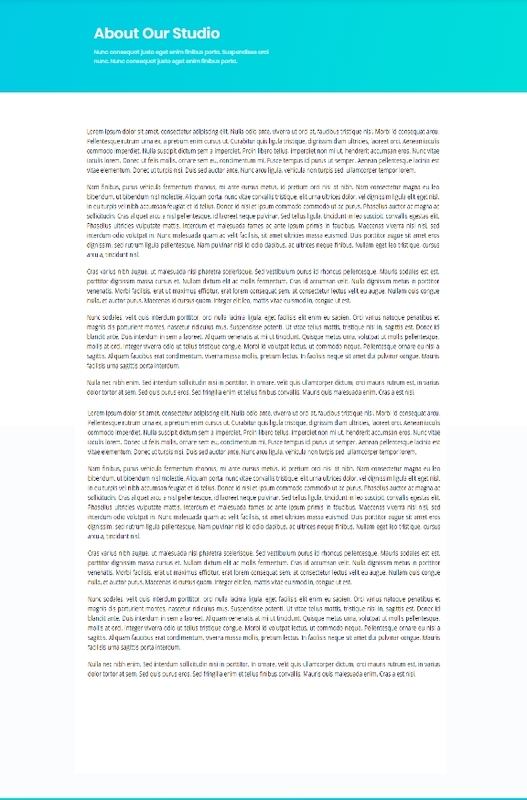 So we went through and edited every single page to ensure that the key message of the content was clear, that it was easier for the browser to read and free from spelling and grammar errors. I went through each page to determine which were less than 600 words. Keep in mind, ‘600 words’ isn’t some sort of magical SEO content number, but I used this as a benchmark to help determine which web pages need a little more content. Once I had a list of pages that need more content, I did some quick keyword research for the topic of each article using the Chrome addon Keywords Everywhere. Keywords Everywhere (Chrome addon) – https://keywordseverywhere.com/. 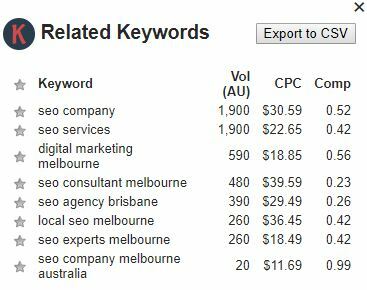 For example, if I had a page I wanted to rank for “SEO marketing Melbourne” I would type that into my Google search bar (when Keywords Everywhere is activated). I would then check if any of the “Related Keywords” make sense as another paragraph (header and body text) within my content. Therefore, I might add a paragraph to my “SEO marketing Melbourne” page with the headline “How do I find a local SEO in Melbourne”. Add write 8-10 sentences on what local SEO is and how that can help businesses in Melbourne gain traffic. What has the impact of the increased traffic been to the business? The business has told me that they are now averaging over one new paying client (actual paying client not lead) per day which is helping them utilise their staff for more hours in the day. If you think your business could benefit from an increase in organic traffic from search engines, feel free to give me a call and we can discuss an SEO strategy for your business. PreviousPrevious post:How to Instantly Improve Customer Service and Increase Sales on Your WebsiteNextNext post:How to Perform SEO in Australia With Free Tools to Gain Rankings! Screaming Frog is really a great tool for site auditing and the keyword everywhere is another cool addon for finding the relevant keywords. You have mentioned every possible and new way to boost traffic. I have recently updated my landing page with great designs and relevant content on it. It’s really working. Also, do some on page works such as content modifying, alt image text changing and opt-in form designing. Thanks for sharing this valuable information. Keep going doing the great work!